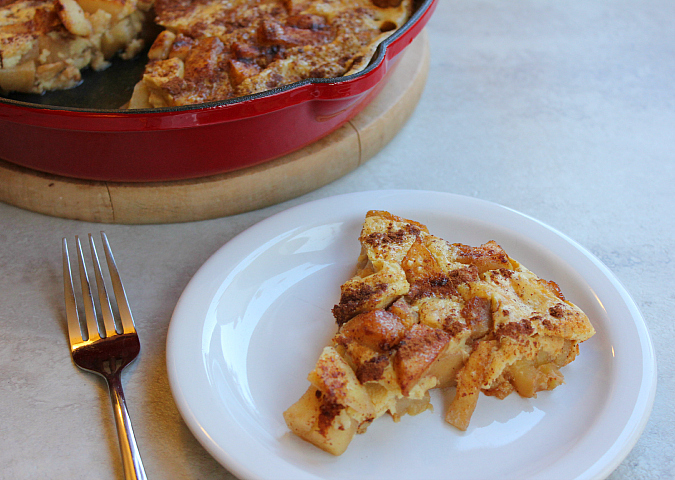 we love using our cast iron skillets in the oven to make breakfasts like puffed pancakes and dutch babies. 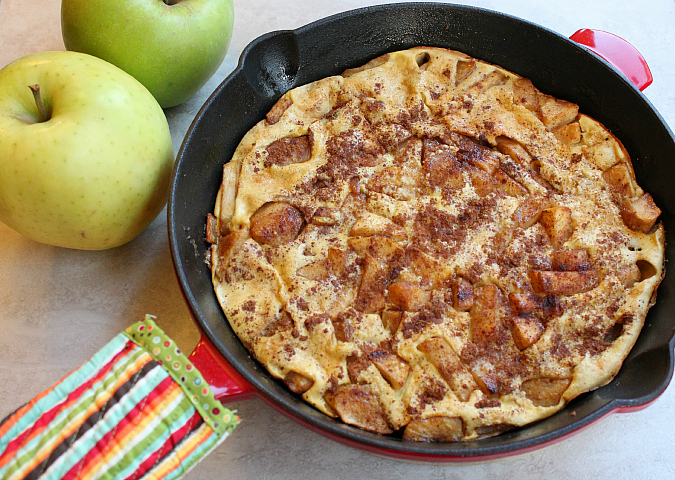 over the weekend we made a spiced apple puffed pancake in our cast iron skillet. 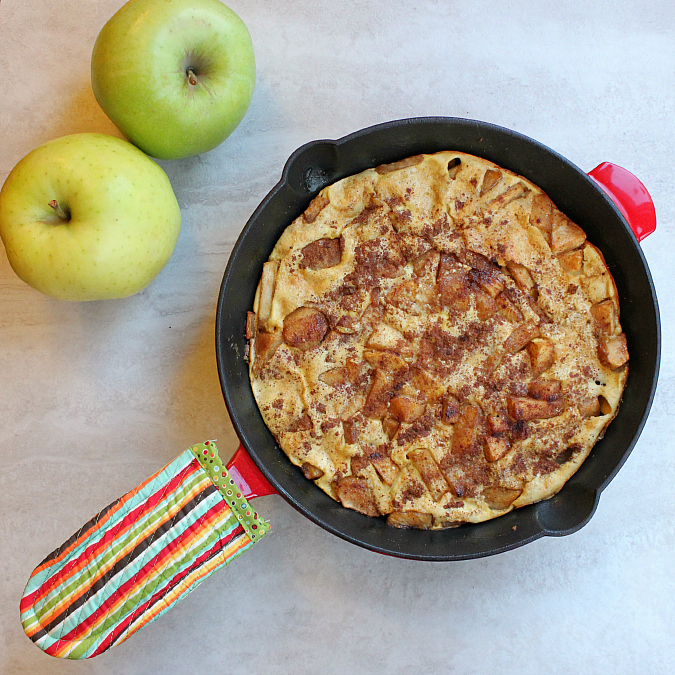 this recipe reminds me so much of this german apple puffed pancake recipe which is one of my all-time favorite breakfasts. this recipe uses one pan which goes right from the stove top to the oven. 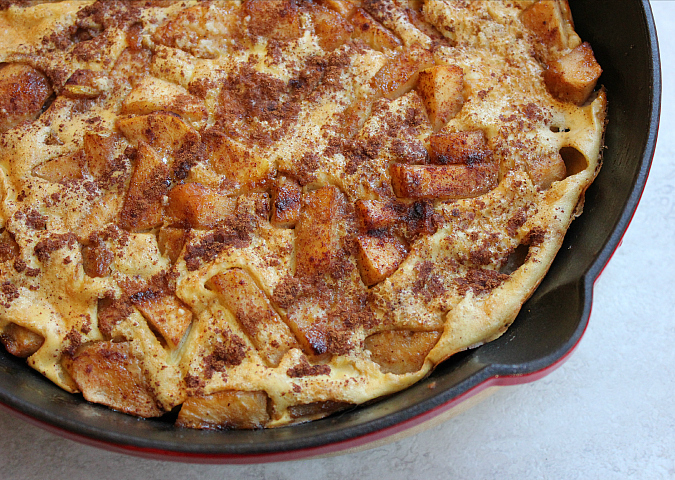 the apples become soft as they saute in the skillet with butter, brown sugar, and fall spices. a thin egg pancake batter (which resembles crape batter) is poured on top, and the whole thing is baked in the oven right in the skillet. this puffed pancake is more custard like than traditional stove-top pancakes. it puffs up as it bakes and becomes so light and fluffy. you can serve hot slices right out of the pan dusted with a little bit of powdered sugar. yum! preheat your oven to 375 degrees F. heat a 10-inch cast iron skillet over medium heat. melt the butter in the skillet and spread the melted butter evenly around the bottom and sides of the skillet. add the apple slices and saute for 2 minutes. add 1 tablespoon of the brown sugar and 1/4 teaspoon of the spices. saute until the apples are soft and tender (about 3 more minutes). in a separate bowl, combine the eggs, almond milk, vanilla, flour, and baking powder. whisk together until no lumps remain. (the batter will be thin.) pour the batter over the apples and sprinkle the remaining 1 tablespoon of the brown sugar and 1/4 teaspoon of spices on top. place the skillet in the oven and bake for 20-22 minutes, until puffed and golden brown. dust the top with powdered sugar and serve warm. Wow! Does that look delicious. I am going to make that tomorrow for breakfast.